At some point in their careers, many OTs contemplate trying out traveling occupational therapy. Not only does it provide tons of experience and exposure to multiple settings, the pay can be very helpful in paying off loans. 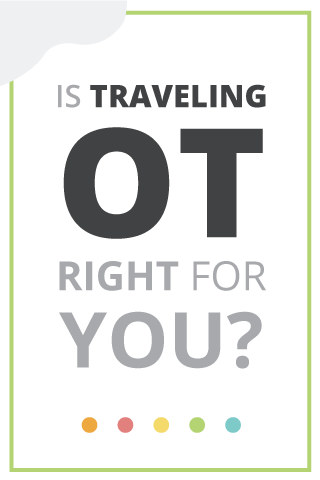 As with any type of practice, there are pros and cons to being a travel OT. This interview with Emily Butler can help you discern if traveling is the right career move for you. At the end, I will share about my favorite travel advocate, Nomadicare. Why did you choose travel OT right out of school? When I graduated from OT school and was considering job options, I was single and didn't feel particularly tied to any specific place to move to and get a permanent job. My good friend from OT school was looking into traveling, and she asked me to travel with her. At that time, becoming a traveling OT with a friend seemed much less daunting than doing it on my own, and since the traveling contracts typically only last 13 weeks, I knew I could take a permanent job in a few months if traveling was not a good fit for me. After weighing the pros and cons, I agreed to give it a try with her. Another major draw to traveling was that with the tax-free stipends I would receive as a "displaced worker." I would make more than I would at traditional occupational therapy jobs. I knew that would enable me to pay off the student loan debt I had accumulated during the three and a half years it took me to get my doctorate. All in all, traveling made a lot of sense for me. How did you decide on an agency? What kind of parameters could you set? While looking into travel companies, I talked with other travelers that I knew from my alma mater and did a lot of research on each of the companies' websites. I had originally decided to go with another company. They had been slowly building a relationship with the friend I was wanting to travel with. They’d been in touch since our 1st year of OT school! We really liked that company until they gave us some bad advice. As traveling OTs, we were not eligible for temporary state licensure in any of the states we planned on working in. The traveling recruiter we were working with advised us to get our California and Washington licenses first as soon as we'd passed the NBCOT exam. The recruiter failed to inform us that the processing time to get state licensers varies greatly state to state. As it happens, California and Washington both require background checks and fingerprinting [which has to be done on their specific fingerprinting form which is mailed to you and then you mail back], and consequently, those states take upwards of three months for the licensure process. As a new grad, I was not interested in waiting to begin working for three months. I needed a paycheck! While we were stressing about the delay with our West Coast licenses, another company contacted us and was very prompt in answering all of our questions. The recruiter told us she could get us two jobs in a different state with an average state licensure processing time of about a week. We jumped on it, and ended up staying with that company for two years. In my experience, the recruiter you work with is just as (if not more!) important than the agency. You need a recruiter who is going to stand up for you, be detail oriented (for your contract, time off requests, etc. ), and timely. Travel jobs get posted and filled within 12 hours at times. If your recruiter isn't moving fast enough, you will miss out on jobs you are interested in. When negotiating travel contracts, my philosophy became, "don't ask, don't get." I had to negotiate for things like getting paid mileage when I was traveling between buildings, and having at least 30 days notice if the facility I was working for found a permanent OT and wanted to replace me (which happened). Don't settle for two weeks notice. It will happen and turn your life on end. Everything is negotiable, and every company will try to lowball you. Stand up for yourself and don't sign a contract you aren't comfortable with. My biggest fear about traveling is being thrown into situations without support; did you feel this way? I had similar fears before my first day at my first placement. When I walked in the door that first day as a new grad fresh out of OT school, the first thing I remember happening is the therapy director hugging me and saying, "She's here! Our angel! We've been so excited for you to come." At that first placement, they had been getting by with PRN staff and were thrilled to have a more stable therapist. They were incredibly supportive and helped me to feel at ease. It also helped that I was traveling with my friend because we could always bounce ideas off each other. Not every facility has been as supportive as that first one. I ended up traveling to only skilled nursing facilities. That's where the demand was while I traveled, and I discovered I really loved geriatrics. In my experience, a patient is a patient, no matter which facility I was working in. They all need therapy. And while I've seen therapy gyms of all shapes and sizes, they all have gait belts and oximeters. When it gets down to it, that's all you really need. Nurses’ stations are easy to find. Patients’ rooms are numbered. If I wasn't lucky enough to get a tour of the facility or much of an orientation, I found I really didn't need it. I kept a growing collection of patient handouts and assessments on my clipboard that I made copies of when needed (finding patient handouts in a disorganized therapy gym was often more trouble than it was worth in the first week at a new building). Also, I traveled to six different sites across the country, and they all used one of the two computerized documentation programs (Casamba and Rehab Optima) I knew. One building I worked at actually transitioned from all handwritten documentation to computerized while I was there, and I was able to help the other therapists with the transition. Already knowing the computerized documentation system meant that it was easier for me to jump in and see patients, and I ultimately required less and less orientation the longer I was a traveler. Most importantly, you need to find a travel company (and recruiter) that will provide you with support. If you stay with the same company, as I did, developing a good and trusting relationship with that company will really help with any problems or issues that you run into. This is personal, but how did traveling affect your social life? Well, for the first year, I traveled with my friend that I mentioned. Being a traveling pair limits job options because you have to find a placement that needs two OTs with the same start date, however it does make the social aspect a lot more fun. I met other traveling pairs while I was traveling who made it work, as well. As it happened, my friend ended up falling in love with a farmer from Iowa, and we stopped traveling together. This impacted my social life. Haha! I did two travel placements on my own, and I chose to travel to large cities. I wasn't interested in living in a tiny town in the middle of nowhere thousands of miles from anyone I knew. I was in Portland and the Seattle area and explored on my own, as well as with people that I met there. My philosophy was to say, "yes!" to anything someone invited me to do (within reason, naturally). It was fun doing things I wouldn't typically do, and traveling definitely brought me out of my shell. How did traveling help you grow as a therapist? Traveling has helped me grow and become an adaptable therapist. I've learned to be flexible and work with a variety of different therapy directors, COTAs with limited experience, and COTAs who have been in the field for 20 years. I've learned a lot from all of the different therapists I've worked with across the country, and have incorporated both "old school" methods and cutting-edge practices. I have also had a lot of practice interviewing for jobs, and don't get nearly as nervous as I used to. It has also helped me determine what is important to me when negotiating contracts while I was applying for my permanent position. Traveling also has turned me into a resourceful and more creative therapist. As I mentioned before, the facilities I worked in varied widely in terms of supplies and space. The smallest therapy "gym" I've worked out of was one drawer of a filing cabinet in the administration office, and the largest was the size of a ballroom and equipped with everything you could possibly need. I learned to work with what I had and think on my feet. The biggest challenge for me as a traveler was trying to "plan" things in my personal life. I usually wouldn't know where I was moving until a week or two beforehand, sometimes less. That made it difficult to buy plane tickets, particularly knowing that if a facility found a permanent therapist, they could cut my 13-week rotation short, meaning I would have to either find another placement close by or move. That part was stressful, especially when trying to travel with another person. Also, depending on where my placement was, finding housing could be stressful. It varied based on tourist season and the part of the country I was in. I had to be very flexible. How about the most rewarding moments? The most rewarding aspect of traveling was something I didn't expect. I felt very appreciated and could tell that the staff was grateful I was there. On my last day, the therapy department and often the nursing staff would give me cards, baked goods, host potlucks and tell me how much they appreciated me and the hard work I put in. It helped me to realize that people do notice when you put in hard work and care about your job; people who I wasn't sure even knew my name would come give me a hug and make sure they said goodbye. I still have all the cards. I'm not saying that the last days were my favorite; saying goodbye is always hard, but my first and last days at each facility definitely stick out in my memory, and the last days were often full of reminiscing and baked goods. If someone was interested in pursuing work as a traveling therapist, how would you recommend they proceed? I would advise them to start contacting any travelers they know and see what they think of the companies they have worked with. Often travelers get referral bonuses so they are motivated to help others sign up for their own company. Also, do your research online and contact a few companies you're interested in. What is the difference in salary offered to a traveling OT with a master's and an OT with a doctorate? I never compared my salary with an OT with a masters degree. From my experience, I believe traveling salaries are more based on region and years of experience in a particular setting. Let's say you are offered a 100k annual salary for being a traveling OT. I was wondering if the housing stipend comes out of your paycheck? If I make sure to put my foot down and ask for things such as paid mileage and whatnot, would that ultimately come out of my paycheck too? What costs would I have to expect to pay at the end of it all and what would be left over? Housing is negotiable. You can choose to have your company find housing for you (which is generally an Extended Stay America long term stay hotel) or you can find your own housing (which takes more work on your end but can save you a lot of money if you find an off season rental home or can live with friends). The housing stipend is calculated based on the cost of living in a region. My housing stipend was a lot larger when I was in California than in Iowa. The other bonus of having the housing stipend as part of your weekly paycheck is that it is tax-free as a displaced worker. Hope that helps! Where do you start when it comes to looking for companies? Do you simply start researching and contact all of them? What kind of questions would you suggest asking when contacting these companies? Also- do you have to sign a contract for a specific time period? Would we be able to do only one year and then get out of travel? When it came to looking for companies, my friend and I put together a list of questions we had for each travel company and then we emailed recruiters from all of the companies. We put together a giant spreadsheet to compare each company and then narrowed down our list based on which company was the most helpful/had the benefits we were looking for. Some recruiters gave us long detailed answers, others did not. That helped us get a sense for the company/recruiter right away. Here is the spreadsheet Emily used! Modify the categories as needed and create your own to aid in finding the right OT traveling position! Medical coverage: Is this free for every placement? Also, how does medical coverage work between placements? For example, what if I want to take off a week between placements, would I still have medical coverage? Is there any life insurance offered? Are meals and incidentals stipend? As part of the travel expense allowance: is there ever the opportunity for car rental when placements are farther away? How much is the CEU annual allowance? Is there any opportunity for student loan repayment? Are there any opportunities for PTO? Are there any opportunities for student loan repayment? The website mentioned completion and renewal bonuses… could you elaborate on this? Another OT and I are hoping to travel together. Is it always possible to get placements in or near the same place? For traveling, the companies really want therapists to work for them, so always remember that they are trying to sell their company to you and take what they say with a grain of salt. You don't have to sign a long term contract for traveling. You can do one 13 week rotation, decide it's not for you and take a permanent job. You could even give your 2 weeks notice your first week if you find it's really not a good fit for you. That's one of the positives of traveling, you're never locked into anything and if you want to try a different company or go to a permanent job, you can do so whenever you want. Did you just get a temporary license in each state? Once you left that state did you ever have to do anything with that license, like recertification? If you wanted to go back to that state did you have to get another temporary license and is there an amount of time you have to wait before applying for another temp license? From my understanding, traveling therapists do not qualify for a temporary license. I got a standard 2 year license for each state, and then once I left each state I would keep the license until it expired and then either pay to keep it "active" if I planned to return there in the next few years or "inactive" if I didn't plan to return. Being inactive is significantly cheaper. It is also an option to let your licenses just expire if you don't think you will ever return to a state. Each state has it's own regulations and they often require a verification letter from all of the other states that you are licensed in when you apply for a new license. From what I understand, a temporary license is for new grads who would like to begin working before their official license is processed, and they have to work with an OT who will supervise them. I've talked with other travelers over the years, and they used the same system I did. There are a few states currently working to have PTs be able to work across state lines without having to be licensed in the 2nd state - i.e. being able to work in Washington under an Oregon license (think of how you use your drivers license). Hopefully OT will follow in PT's footsteps if they are able to get that law passed- ideally nationwide. Talk to your state representatives! Travel OT provides countless opportunities to grow. Not only can you experience a wide variety of settings and patient populations, you can also work in a number of locations across the country. Traveling and living in new places exposes you to ways of life you might not otherwise know. In my opinion, travel OT is one of the best ways to grow not just as a clinician, but also as a person. ﻿Ready to start exploring what’s out there? Emily traveled before my favorite OT travel site, Nomadicare, came into existence. Nomadicare was started by Laura Latimer, OTR/L, a travel therapist. Laura vet recruiters using her extensive knowledge and experience. I highly recommend exploring her services. (And don’t worry, the travel companies bear the cost of her work! For travelers getting a match is free!) I am a proud partner of the work Nomadicare is doing to advocate for OTs! ! Through her website, Nomadicare, Laura Latimer, OTR/L will match you with a vetted recruiter.